Vape in your favorite electronic cigarette device and enjoy the flavor of Black Tea. Add a few drops of Lemon flavored e-liquid or Cream flavored e-liquid. Vape it the way you drink it and enjoy!! Take advantage of our e Cigarette Liquid deals and save with the most effective e Cigarette Liquid solution offered on the market. 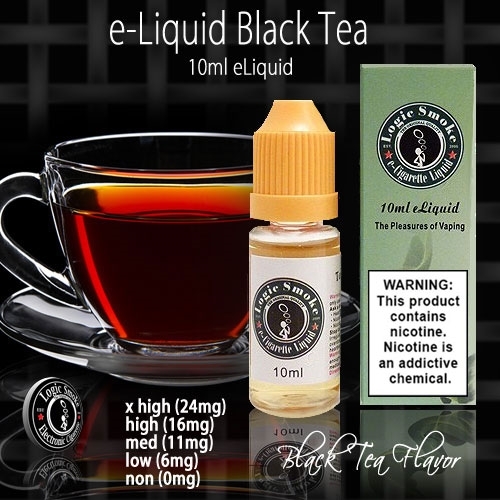 For best solutions and plenty of savings use our electronic cigarette e-liquid. Our e-Cigarette liquid is a PG/VG (80/20)mix. A PG based e liquid gives users’ lots of vapor with a stronger throat hit, as well as, more flavors and a more enjoyable smoking experience.